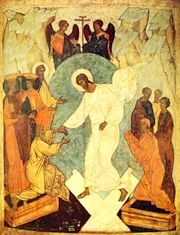 The feast of Holy Saturday falls on the day before Pascha. It is also called The Great Sabbath since it is said that on this day Christ "rested" in the tomb, in death. But it is also believed that it was on this day he performed in spirit the Harrowing of Hell and raised up to Paradise those held captive there. Therefore, at the main liturgical celebration, a vesperal Divine Liturgy of St. Basil the Great, the hangings, altar cloths, and vestments are changed from black to white prior to the epistle reading. The first service of Holy Saturday takes place in the morning and breaks the somber spell. Jesus' descent to Hades where He preached His message to the dead is celebrated. Those who believed in Him received eternal life and salvation. The heavy sorrow of Great Friday begins to lift when the priest, wearing bright vestments, chants, "Arise, O God, to the world," while sprinkling laurel leaves, bay leaves, and flower petals all over the church to symbolize the shattered gates and broken chains of hell. This is also to celebrate the triumph over death. O Giver of Life, Christ our God, glory to You! Wrapped in fine linen and spices. The Immortal One is laid in a tomb as a mortal man. On which Christ has fallen asleep to rise on the third day!" This page was last edited on November 15, 2010, at 02:01. This page has been accessed 25,144 times.